Who needs an alcohol awareness card? Alcohol awareness training is required in Nevada Counties (Clark and Washoe County) with a population of 400,000 or more. An alcohol awareness card is required for owners, operators, managers, bartenders, wait staff, servers, security guards, cashiers, stock handlers, and clerks at casinos, bars, restaurants, night clubs, and grocery/convenience stores. Minimum age to obtain an alcohol card is 16 years old. How do I get my alcohol card? Getting your alcohol awareness card is quick and easy! Take the Alcohol Daddy® online course and then stop by our office to take a quick 10-minute exam and receive your card. The fee for the card is only $20.00. Our office is located at 3160 S. Valley View Blvd, Suite 108, Las Vegas, NV 89102 (near Valley View and Desert Inn – map). Your Alcohol Daddy® Alcohol Awareness card will be valid for 4 years. When it is time to renew, simply take the online or classroom course again to receive a new card. Yes! 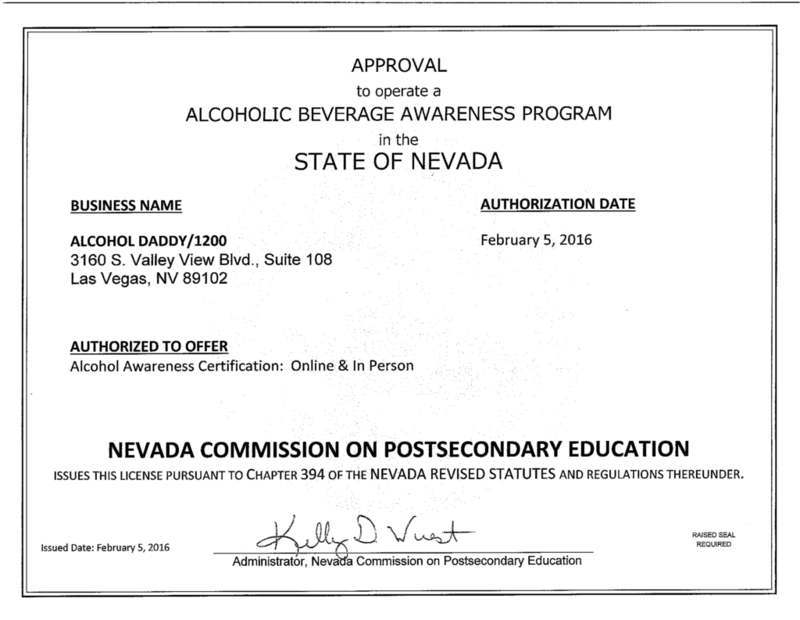 Alcohol Daddy® is a Nevada State-certified Alcohol Beverage Awareness Program approved by the Nevada Commission on Postsecondary Education and meets employment requirements for alcohol awareness training. Your card will be accepted at any Nevada establishment or position that requires an alcohol awareness card. What is a TAM® card? TAM® stands for Techniques of Alcohol Management® and is a registered trademark of MLBA. A TAM® card is simply an alcohol awareness card issued by that company. Alcohol Daddy® is not affiliated with TAM® and does not issue out their cards. Upon successful completion of an official Alcohol Daddy® course, you will receive an Alcohol Daddy® card, which is equivalent to a TAM® card and accepted everywhere. Your card will be valid state-wide in all Nevada counties and municipalities for a period of 4 years. What if I lose or misplace my alcohol card? To get a replacement alcohol card, please contact us. The fee for a replacement card is $10.00 and will be picked up at the office. Do you offer on-site group training for employees as well as any discounts? Yes! Alcohol Daddy® can come on-site and provide the training to all employees any day and time of the week that is convenient for your team. Alternatively, employees can take the online course on their own time and we will come out and do the testing at your location! Visit our Group Specials page for more information. Please contact us with your training requirements or if you have any additional questions. Do you offer any other services or certification programs? Absolutely! 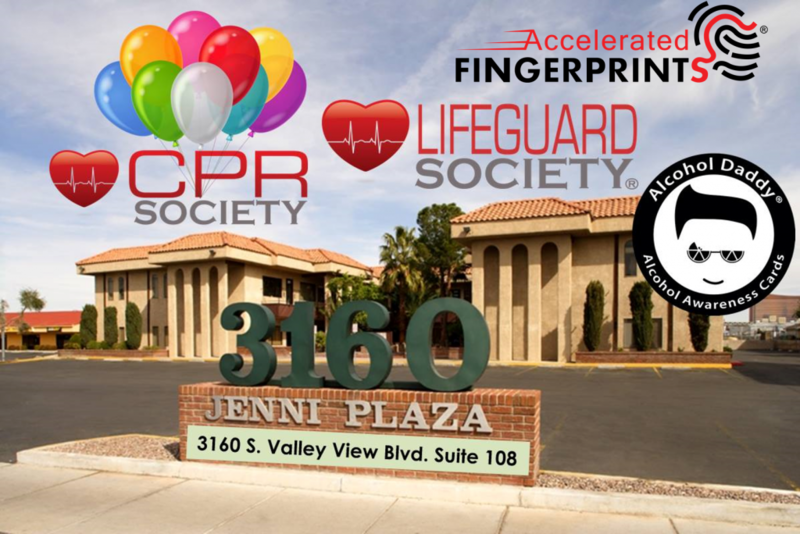 Alcohol Daddy® is is located in the same office as CPR Society, Lifeguard Society and Accelerated Fingerprints. Our affiliated companies provide services in CPR/AED/First Aid certification classes, Lifeguard classes and fingerprinting. Your employees can receive all of their certifications in ONE convenient location, located only 5 minutes west of the Las Vegas Strip!